I was trying to play an .arf file today. After installing the webex player, I found out that .arf files was already associated with another media player (windows media player in my case) and as a result, the webex player wasn’t used to play the .arf file. What happens next is what most people will usually do (for Windows users). 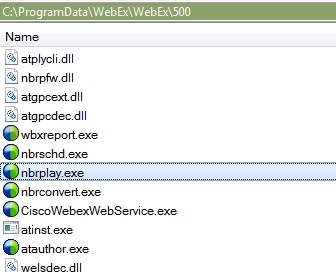 Right click on the .arf file > Open with… and browse for the webex player executable. Well, guess what? The installation path isn’t in program files. It’s in C:\ProgramData. thank you guy! saved my live! SO HELPFUL. Oh man, I was getting so angry with myself for not being able to find it. You rock.